As ARM based SoC (System-on-Chip) technology continues to evolve, support for a wider range of interfaces is being added, such as PCI-express, Gigabit Ethernet, HDMI, etc. The Apalis® family of modules powered by ARM based SoCs will enable customers to benefit from these enhancements. As the pace in performance advancement is accelerating faster than the increase in performance efficiency, we are seeing an increasing trend in power consumption in high performance ARM based SoCs. Whilst passive cooling is still perfectly viable in many applications, this increase in power consumption means that allowances for additional cooling solutions, such as heat spreaders for conduction cooling, must be made. The Apalis® module provides a robust, rigid mounting mechanism to support such thermal solutions. 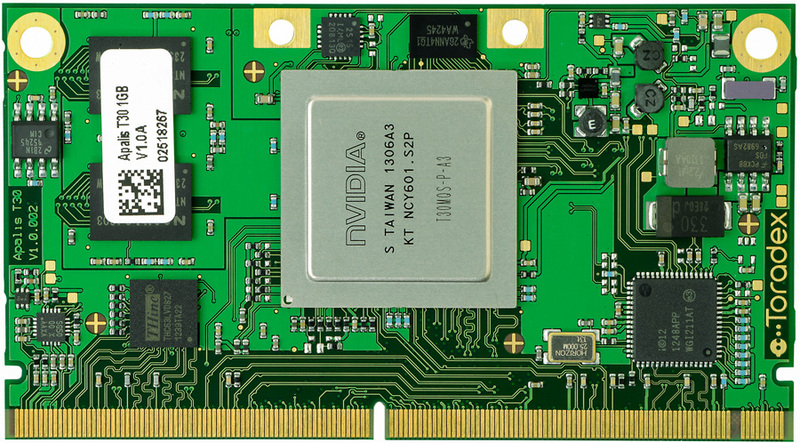 The Apalis® family of modules is based on MXM3 (Mobile PCI-Express Module) edge connector. This connector has been adopted by various manufacturers for use in the embedded CoM market. It makes them them suitable for a wide range of applications. The Apalis® module encapsulates the complexity associated with modern day electronic design, such as high speed impedance controlled layouts with high component density utilizing blind and buried via technology. This allows the customer to create a carrier board which implements the application specific electronics, which is generally much less complicated. The Apalis® module takes this one step further and implements an interface pin out, which allows direct connection of real world I/O ports without needing to cross traces or traverse layers, referred to as Direct Breakout™. This becomes increasingly important for customers as more interfaces move toward high speed, serial technologies that use impedance controlled differential pairs, as it allows them to easily route such interfaces to common connectors in a simple, robust fashion. It should be clearly noted that the Apalis® computer module family is not a replacement for the Colibri computer module family. Both are very complementary to one another, and whilst may overlap in terms of suitability for some specific applications, they differ significantly in a variety of areas including, but not limited to, performance, size, features and price. For information regarding a specific Apalis® module, please select from the following list. The Toradex Pinout Designer is a powerful tool for configuring the pin muxing of the Colibri and Apalis modules. The tool allows comparing the interfaces of the different Toradex modules. It's easy to check whether existing carrier boards are compatible with the latest Toradex modules. The Apalis standard white paper summarizes the benefits of the new, independent computer module architecture and also includes a feature-wise comparison between Apalis modules and competing modules based on other popular embedded standards. For further information on detailed aspects of the Apalis module family, please search our knowledge base.